Old town Lucerne in Switzerland is a beautiful place with enough to keep you occupied for a week, but I had three nights in early September, and had to make the most of it. 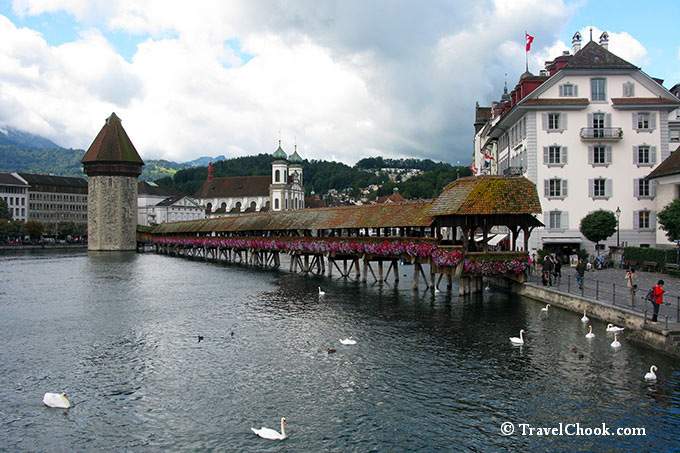 A drop dead gorgeous town with its ancient flower laden bridges, fortifications, fast flowing river through the centre of town and a beautiful huge lake, Lucerne is memorable for all the right reasons. 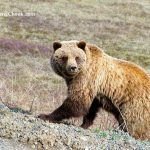 Three nights and three days was just enough to pack in key sightseeing and activities, but I could have stayed a lot longer. Spending three nights at the Hotel des Alpes in the old town which lies right on the Reuss River with the Chapel Bridge in perfect view was ideal. I found it to be prime location for walking around Lucerne’s old town. Getting off the train at Zurich and walking with my large case on wheels across the river to our hotel was an easy ten minute walk, scenic and very safe to do. I had booked a front room in our hotel overlooking the Reuss River – dreamy. 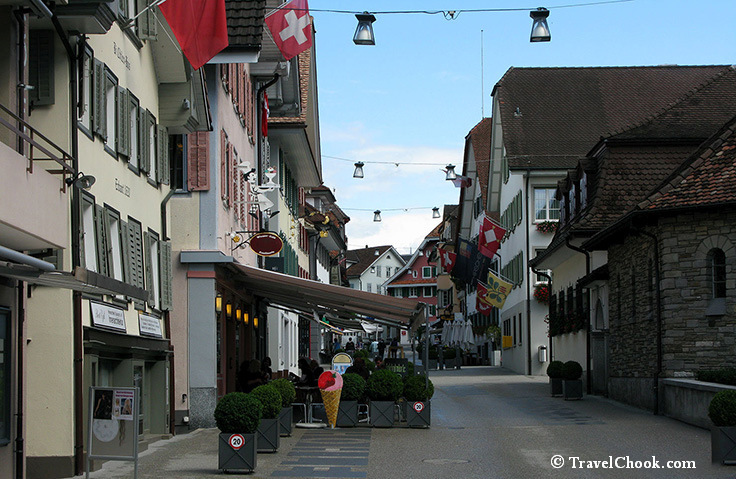 Lucerne is one of those destinations where everything is walkable, especially if staying in the old town near the river. But rather than me explain here and now, let me take an extract from my trip diary and insert it here. Tip 1: Do not leave stuff (like your backpack) on the train when you get off or you may give yourself a heart attack…. 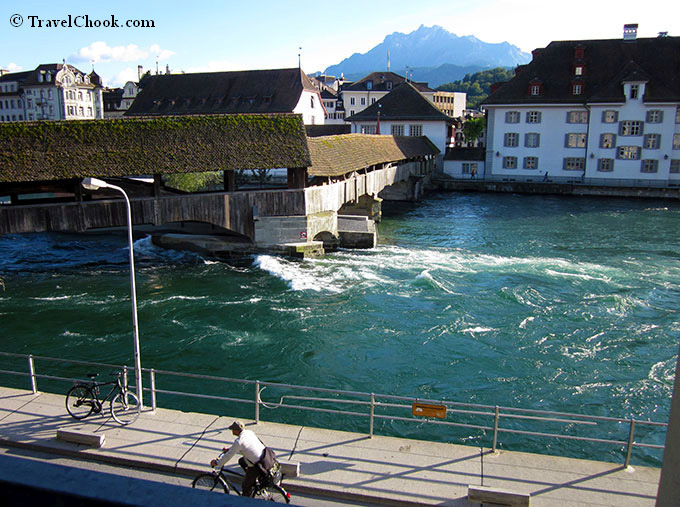 Walking from Lucerne train station to our hotel was only about a ten minute walk across the gorgeous river. Yes, I was wheeling a rather large suitcase (which I have since trashed to get a smaller one), and carrying a backpack and cross body handbag, but it was a really easy and pleasant walk across to the old part of town. 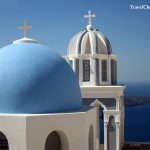 There are cute cobbled alleyways, magnificent old buildings with spires and incredibly beautiful murals on many of the buildings. I’d heard Switzerland was very expensive, but was surprised to find prices of everything are almost the same as back home in Australia and in many cases even cheaper. This is when it first dawned on me how expensive my own country actually is. Being jet lagged, but wide-eyed, I pounded the beautiful streets until after dark. 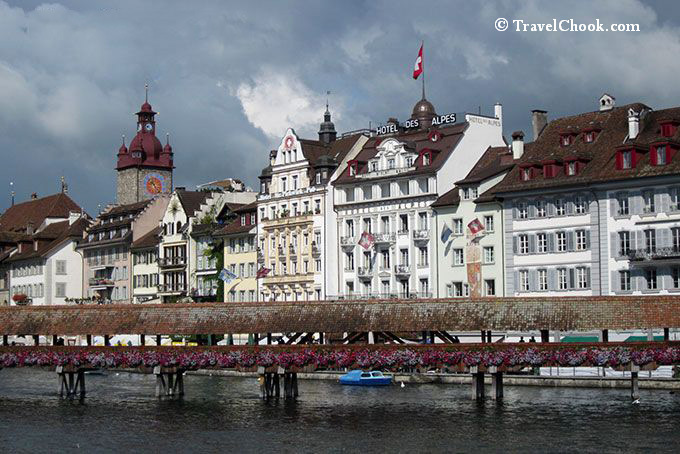 A must-see in Lucerne is the famous ancient bridge. Kapellbrucke, otherwise known as Chapel Bridge. 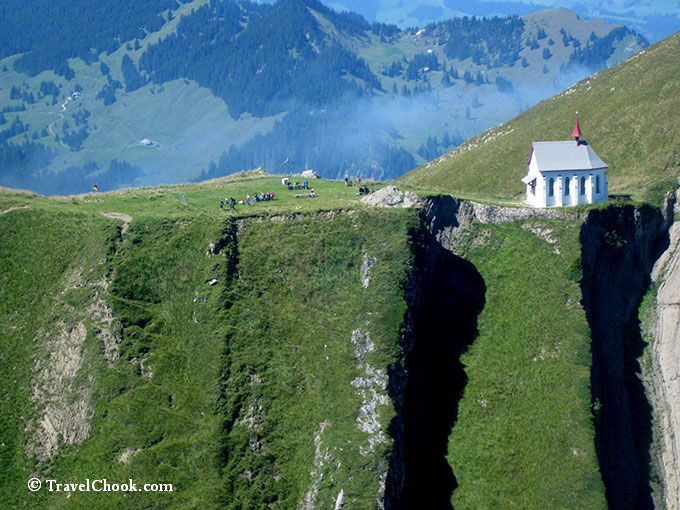 It is absolutely dreamlike. Being on the bridge feels like being in a fairytale – the ancient bridge dates back to around 1333 and is the oldest covered wood bridge in Europe. Of course I have one rule, when in another country, you must sample the local cuisine. I had been imagining cheesy fondue so Fondue House seemed the logical place. Dipping bread and potatoes in cheese fondue was a little more than the stomach had bargained for though. The fondue was made with gruyere and garlic and was very strong in taste. Next time I’ll make it an entree serve! 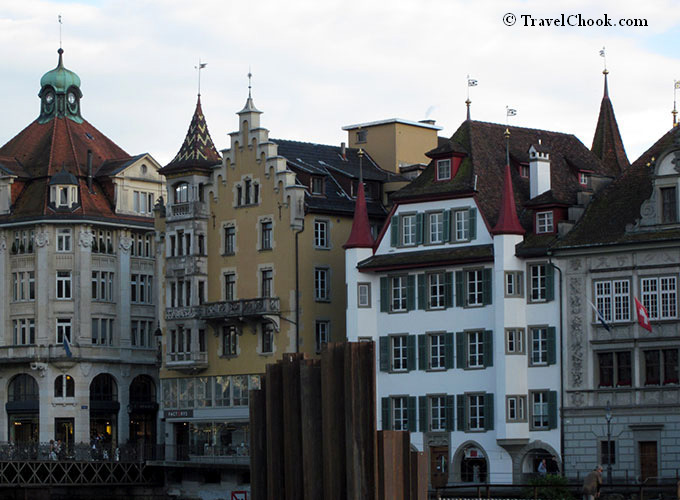 If you are planning a stay in Lucerne, definitely stay in the old part of town (across the other side of the river from the train station). 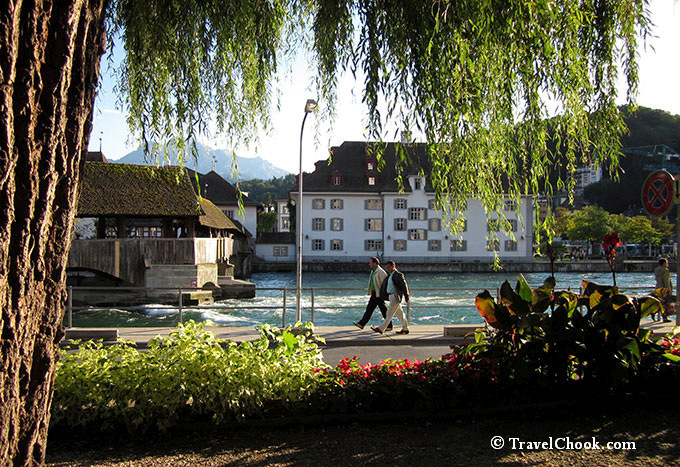 It is an easy leisurely ten minute stroll (wheeling a large suitcase and carrying a backpack) from the train station across the river to the hotel I stayed at in the old beautiful part of Lucerne. After much research, I chose Hotel Des Alpes because of its location in a beautiful old part of town overlooking the river. It turned out to be the perfect place, centrally located, great room, fantastic breakfast, and a very scenic breakfast balcony overlooking the river. I can only comment on the category of room I stayed in, which was a River View Room with a balcony (which I think they now call a Lakeside room). It was attractive, comfortable, and with a stunning view to remember. Lucerne kept me so busy though, that I was really only in the room to sleep. So if I was to go there again on a tight budget, I would probably just get a town facing view. But if I were to go there again with extra cash or planning to spend a little more time in the room, then the river/lake view room would be 100% worth paying the extra for, as it is exceptionally beautiful. The day started with breakfast at Hotel Des Alpes (as it was included in the rate). The breakfast room has a wonderful vista over the river and served us up cold meats, cheeses, juices, boiled eggs, coffee, and the best croissants I’ve ever had. What a view to start the day off brilliantly! After a leisurely stroll to Lake Lucerne, it was time to have a drink and watch the swans in the crisp exhilarating air while waiting for the ferry steamer boat. Loving that Swiss Travel Pass! 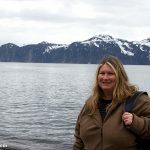 Taking the ferry and cruising Lake Lucerne past villas, small castles, beautiful old buildings and snow tipped peaks in the distance is just such a wonderful and memorable way to spend a morning. 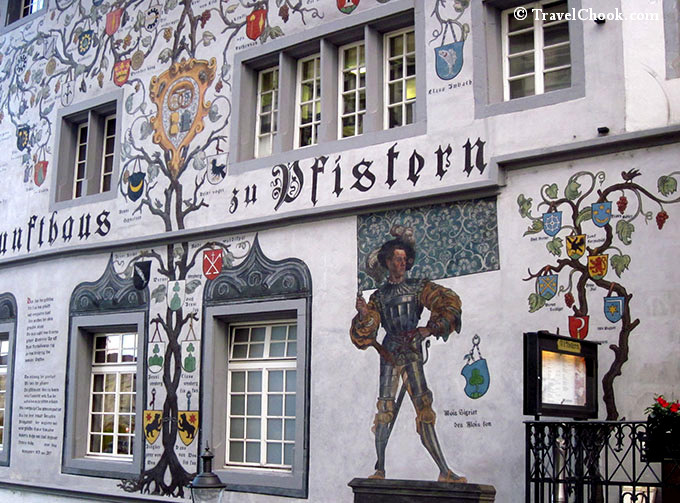 An hour or so later, the tiny town of Kussnacht called, so when the boat docked, it was time to have a look around. 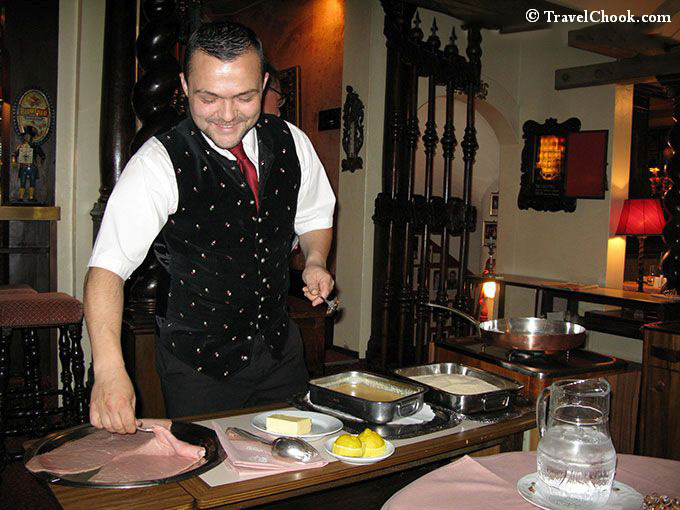 Wandering out of the main tourist precinct led to a little tavern style restaurant called Restaurant Posthorn. It had a few locals who were clearly good friends with the chef. The waitress couldn’t speak a word of English, but then the chef came out and certainly understood the word ‘lunch’! “Oh oh lunch!” he exclaimed. “Yes yes, come, sit,” the chef beamed, an absolutely charming man who couldn’t do enough to make us right at home. I ordered pork Cordon Bleu which was so good I wanted to lick the plate. The chef made us feel so welcome fussing over us and making the lunch very special. 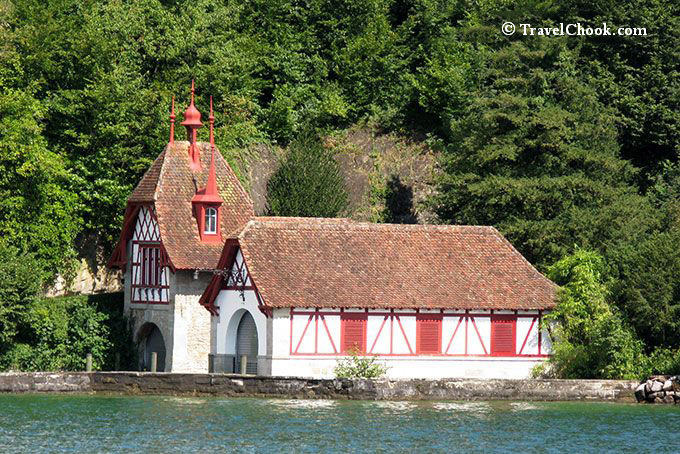 Kussnacht was a lovely place for lunch, a wander, and to enjoy the ducks and views by the lake, until it was time to take the scenic ferry back down Lake Lucerne. The afternoon was spent wandering around the city, and walking through some beautiful quiet cobbled backstreets to get to the huge wall and towers that were built hundreds of years ago to protect the city of Lucerne. 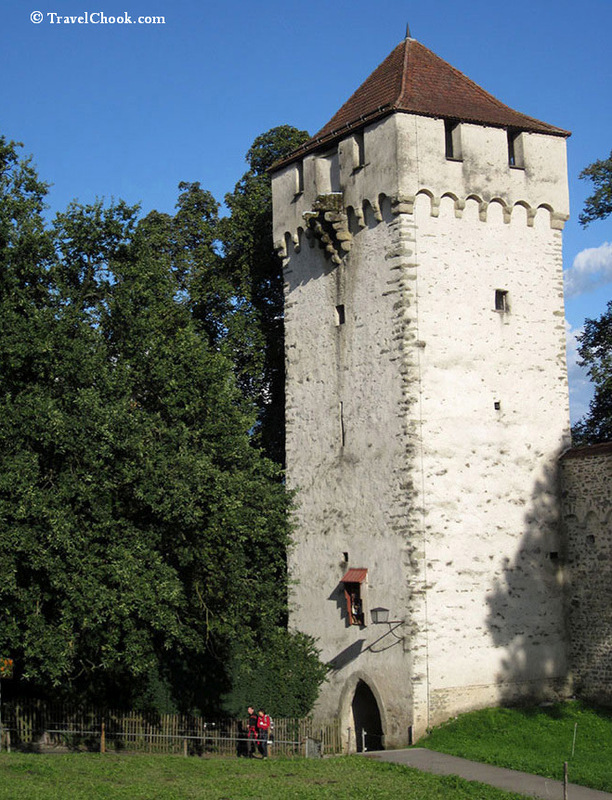 You can walk into the fortress tower and up the stairs – it leaves you with a very empty lonely feeling. 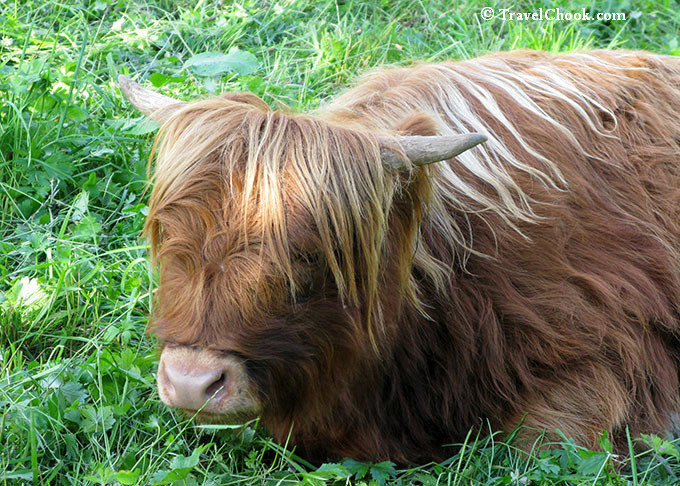 Behind the city wall was a paddock housing some very hairy cows with massive horns which I couldn’t resist taking a picture of and sharing here – too cute! That night we dined on schnitzels. The old town of Lucerne around the river is lovely to wander around and cross the Chapel Bridge at night. I felt very safe around that area. 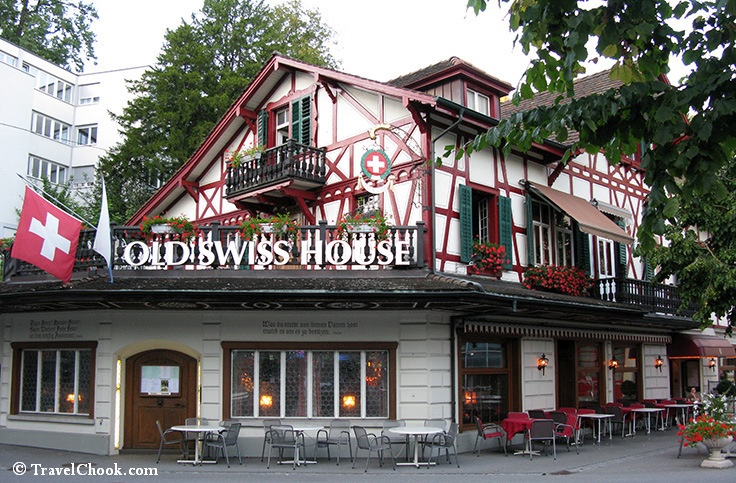 Dinner at Old Swiss House for the history, ambience, and their house speciality – the schnitzel! The walls are lined with interesting pictures of incredibly famous people who have dined there. The Golden Round Trip to Mt Pilatus started with a stroll to to Lake Lucerne to catch an early ninety min boat ride to Alpachsted. The boat ride is like a dream with such beautiful scenery surrounding us. The weather is stunning. 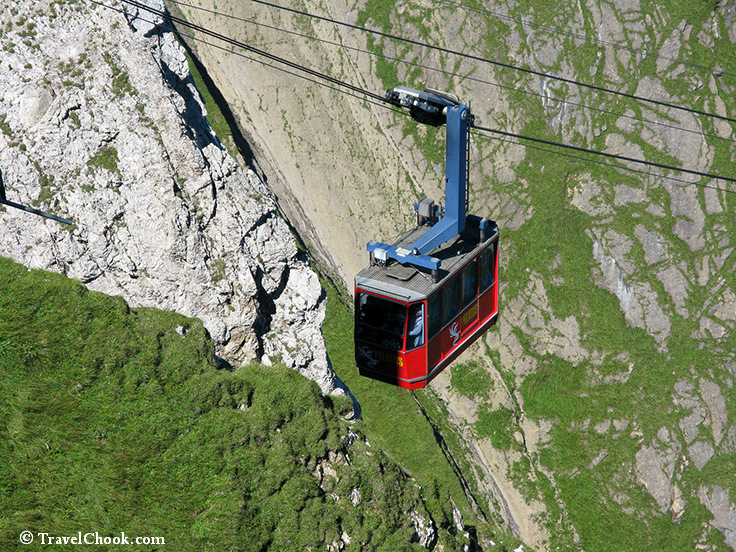 At Alpachsted, you get the steepest cog railway in the world up to Mt Pilatus. 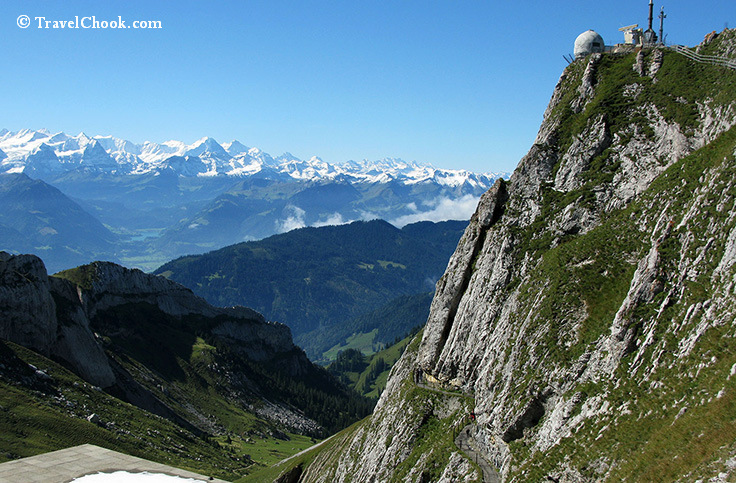 The views from Mt Pilatus across lakes, mountains and snow capped peaks were breath taking! 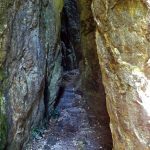 Walking all over Pilatus you can enjoy jaw dropping views along all the walkways and scenic lookouts, and spend hours there. There is even a kiosk where I will confess I couldn’t resist some cheap tasty bratwursts.. There was lovely snow scattered around the kiosk and rocks – oh so scenic. 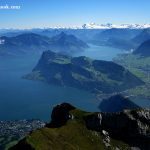 After spending most of the day at Mt Pilatus, you get a gondola and cable car down to Kriens, then walk to the bus station to get the bus back to Lucerne. 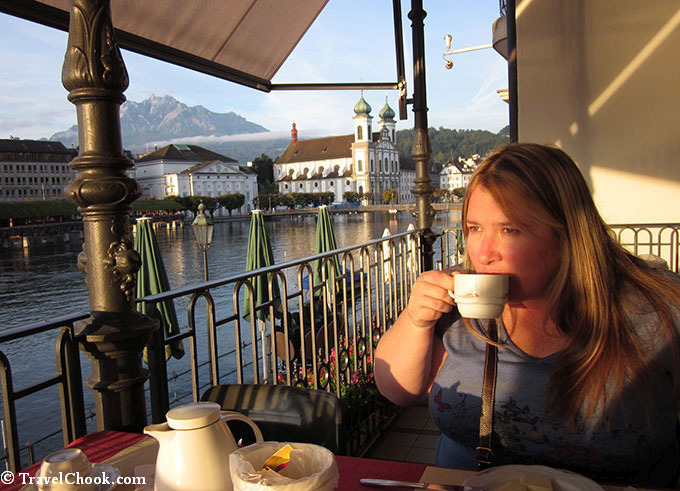 Back in Lucerne, it was immensely pleasurable to sit down and relax with a cafe freddo on the banks of the River Reuss at Psfistern Restaurant – lovely. Personally, I couldn’t get enough of the divine Reuss. 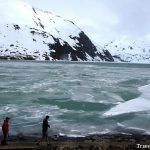 It is so fast moving, so alive, thought-provoking – such an interesting river. Personally, I could have sat there all day if I had the time. To visit the Lion Monument was just a short stroll away. 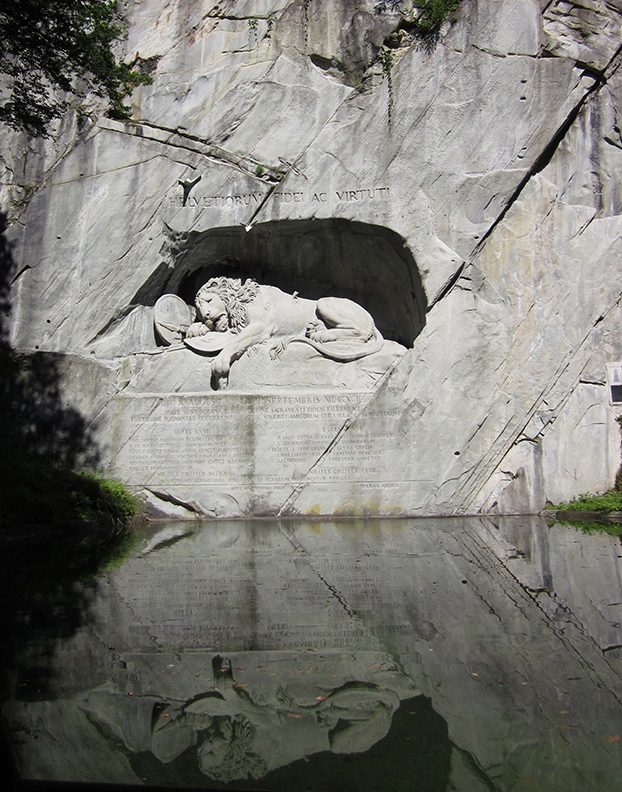 The monument was carved out of rock in the 1800’s to commemorate the heroic Swiss Guards who died during the French Revolution in the 1700’s. The carving itself is extraordinary. It has the effect of evoking the emotion of sadness. 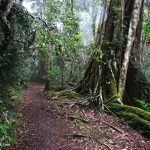 It is a beautiful, serene, place, which invites contemplation, as it should. 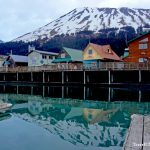 The carving is reflected in the water in my picture below. I spent at least an hour at the Lion Monument sitting there in mostly silence. Bordering on early evening, I stumbled across the Glacier Garden Museum and was surprised to discover it was was still open, and the Swiss Pass let us in for free. 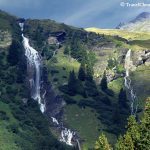 This Swiss pass has been like the key to the city, it has let me into so many things without having to pay, or at greatly reduced prices. I must admit I wasn’t at the museum very long before it closed, but it didn’t require much time anyway. Then I headed over to a bar for a few drinks. If you go to any restaurant in Lucerne, make it Old Swiss House for a most spectacular schnitzel dinner. The place is very popular, so ideally make a reservation at least a night or 2 in advance. I did as I was told by a local and ordered the restaurant specialty which was the thinnest veal schnitzels I have ever seen. A lovely guy wheeled over a bench with all the ingredients on it, and cooked our wiener schnitzels right at the table with so much butter that I thought I would die. The schnitzel was first coated in egg and parmesan, then breadcrumbs, and fried in butter. 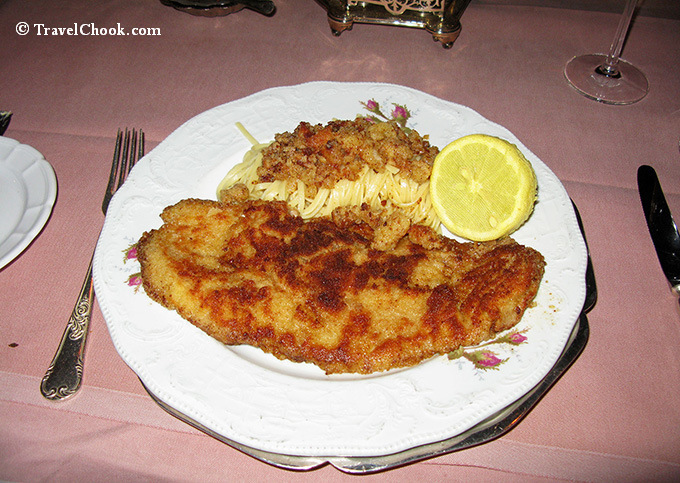 It was served with butter noodles and lemon – a decadent and delicious meal – best schnitzel ever! The restaurant itself is so old and atmospheric with the stairway wall lined with pictures of famous old Hollywood movie stars and legendary singers who had dined there back in the day. The whole night was amazing and I will never forget it. I won’t lie, it was expensive, but it was such a special experience I found it worth every cent and a must-do for schnitzel lovers. 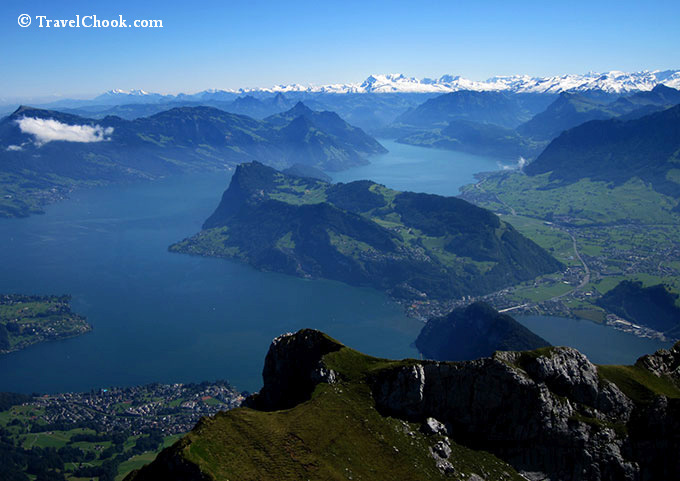 It is easy to see why so many people love Lucerne! 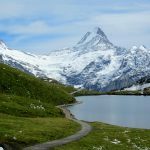 Another reason you could easily spend over a week there, is because it is so convenient to so many great places – it is a great place to base oneself for sightseeing by train and boat with a Swiss Pass. 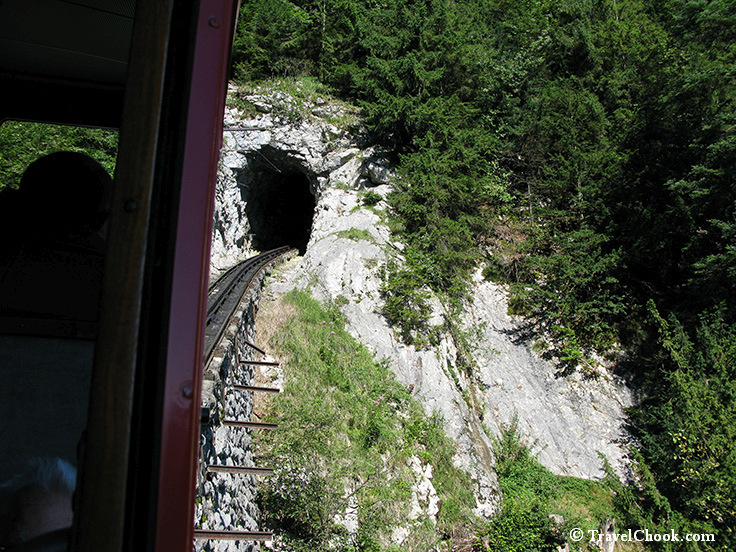 The next morning: caught the train to Grindelwald in the Bernese Oberland for the next adventure in Grindelwald. 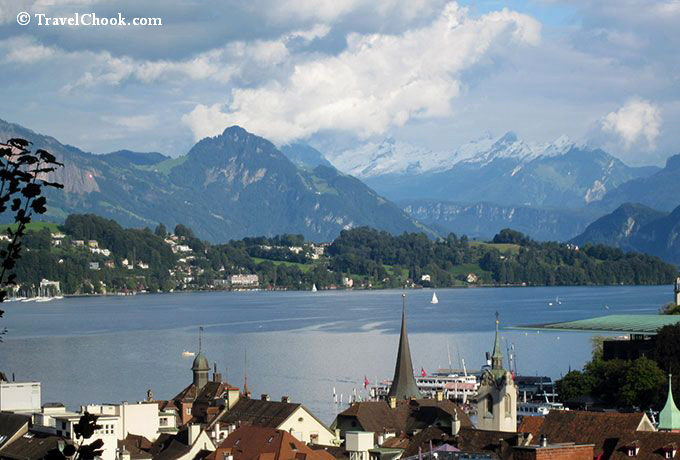 What are your thoughts on Lucerne? Love it or like it and why?